Decubitus Block with Image Receptor Plate/Cassette Holder. Aides the technologists in positioning patients for cross-table lateral examinations. 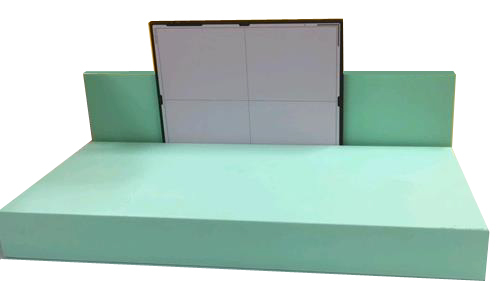 The decubitus pad ensures that the patient is elevated into a position above the plane of the imaging receptor for adequate imaging of the targeted body part. Provides excellent support and spine correction for laterals and decubitus views. Lower half is 4” tall x 36" long x 16" deep. Back is 11” tall x 36" long x 10" deep. The unique angles incorporated into every sponge offers artifact-free imaging and increased stability.Anti-microbial: antibacterial and antifungal. Self-deodorizing. Meets the new California 2015 Technical Bulletin #117-2013 standards. New Fresh light mint green coating.